At Shri Kali Ashram one learns the whole science of Tantra, both the physical and spiritual. We train you to achieve skill in āsanas, prāṇāyāma, bandhas, kriyās, mudrās, and kuṇḍalinī (sexual practice). 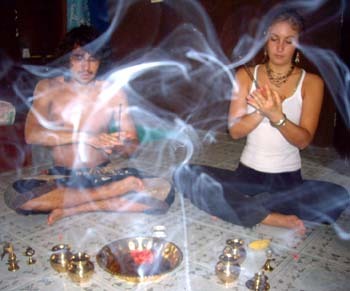 We also teach the ideology, philosophy and practices of Tantra including mantras and ritual. We contrast New Age and Traditional teachings so that our students understand the value of Traditional Tantra and Yoga. Our initiation brings one to actually become a Tantric. With this knowledge, one can realistically represent as a Tantric or a Yogi and be a qualified professional teacher. It can also be regarded as an intensive course to step out of your everyday life and contemplate on life's broader purpose in our relaxed environment. We make Monism (Advaita) our culture of life. Tantra is a timeless science which has been preserved and transmitted for millennia through its ācāryas (qualified spiritual teachers) and sacred texts. We teach all aspects of Tantra from the traditional perspective and validate the teachings through traditional texts (as Parātrīśikā-Vivaraṇa: The Secret of Tantric Mysticism by Abhinavagupta), not from translations or contemporary readings of Tantra. The physical aspects of Tantra (kuṇḍalinī, sexual control) take about six months to a year to attain in our system. Tantric Initiation takes us to new vistas of knowledge and experience and leads one to become sacred and optimal. The initiation and its knowledge gives us integration and a wholesome Identity that protects against the traps of ignorance and negativity. Tantra is a life path. The more firmly you are able to ground yourself on this path, the more easily you will be able to carry the Tantric ideology forward into all aspects of life and to share this knowledge as a Tantric practitioner and teacher. Our Tantra courses are designed not as just academic courses—to just give an intellectual understanding, but as doors through which you walk into actually becoming a wholesome human being. You become a Tantric!